Discover the epitome of Palm Beach grace and charm at the historic, all-suite Bradley Park Hotel. 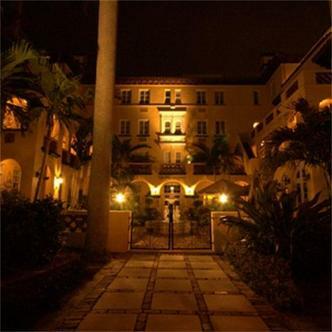 Built in 1907, the history of the 31-suite Bradley Park is linked with Palm Beach's origins as a resort dedicated to a lifestyle of grace and luxury. Palm Beach's stellar attractions of beach, shopping, culture and the sporting life are as fine as they were a century ago, when captains of industry, royalty and celebrities wintered in palaces of spectacular luxuryand in South Florida's glorious climate. Indeed, The Bradley Park has much in common with the opulent, Mediterranean-style homes on Palm Beach's Ocean Drive, and continues the Palm Beach tradition of attracting discriminating travelers. Bradley Park guests often feel as if they were privileged company at a private mansion. The suites are furnished with every amenity necessary for a weekend stay or a longer sojourn. The plush, home-like accommodations satisfy and anticipate the tastes and requirements of today's families, romantics, business groups, and vacationers. Ensconced in a richly appointed 'home away from home' at The Bradley Park, guests discover why Palm Beach touts 'the best of everything' required for the good life, especially a warm, welcoming place to rest one's royal head in comfort and luxury.